Here's a little experiment: Pinch your thumb and fingers together, and then on your Mac's trackpad, spread your fingers back out. This gesture sweeps aside every window you have open to reveal your Desktop in all its messy glory. Full disclosure: I'm typically quite strict about cleaning up my Desktop between projects, and I still have 32 different files and folders sitting there in limbo right now, waiting to be filed in their proper places or deleted entirely. 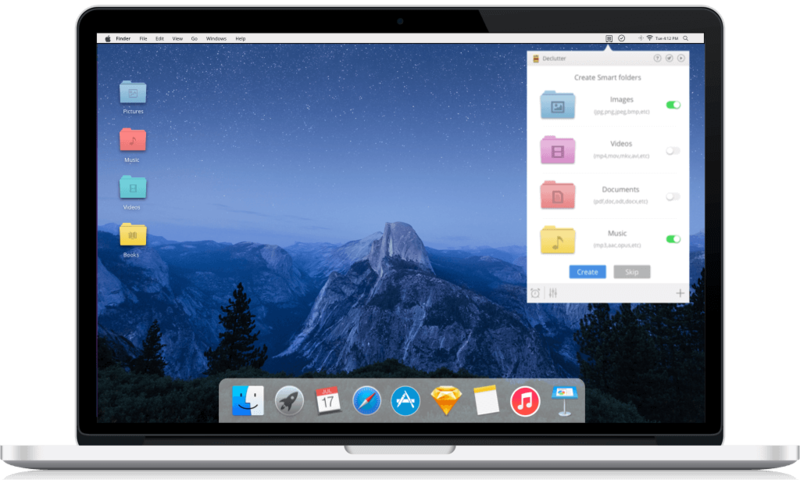 Declutter from MacAppStudio makes quick work of even the messiest Desktops, and it's available in Setapp now. Working with a clean surface actually speeds up your Mac a little, and it's also just a good habit to get into. When you don't see file icons and labels peeking out from behind your windows, you're less likely to get distracted by all the stuff you aren't working on at the moment. The first time you launch Declutter, you have to allow it to access your Desktop. From then on, it lives in your Menubar, and when you click it, the drop-down interface will offer to create Smart Folders for Images, Videos, Documents, and Music. Each Smart Folder collects specific file types by default, but you can add that list by clicking one of the Smart Folders in the drop-down to tweak its settings. For example, I added GIF to the file extension filter for the Images folder, but you might prefer to have GIFs sorted into the Videos folder instead. There's also a file name filter (that's empty by default), so if a file is labeled "screen shot" for example, it could also go in Images, regardless of file extension. Once you're set up, running Declutter couldn't be simpler. To organize your Desktop, simply click the blue Declutter Now button at the bottom, and Declutter will instantly sort the files on your desktop into their respective smart folders. Files that don't fit into one of the smart folders will stay on your Desktop right where they were, and the rest of your files are moved to the Smart Folders now on your Desktop. This makes it easier for you to peruse those files by type and see if you want to delete them or move them somewhere else. Or you could just let them accumulate in the Smart Folders, and at least those are the only things still on your Desktop. What about the files that weren't sorted? You can take a look at those too, and decide to delete them or move them manually, for example. Or just add their extensions to Declutter's Smart Folders ad they'll be sorted next time. For example, I had some Pixelmator files left over, which I decided to have Declutter sort to the Images folder in the future. Need more smart folders? Just click the + at the bottom-right of the Declutter drop-down, and you can create a new Smart Folder, give it a name, choose its color an icon, and list what file types should go inside. You could create one for screenshots, archives, or anything you like. Declutter can be as manual or as automatic as you'd like, but either way it requires almost no fiddling from you. By default, Automatic Mode is turned on; just click the alarm clock icon at the bottom-left to move the slider to your preferred interval. Declutter can organize your Desktop every minute (probably overkill for most users), to every hour (much more reasonable!) or every eight hours max. But if you don't want Declutter to sort your Desktop files automatically—maybe you want to do it yourself at the end of every project, or at the end of the day. No sweat. Just turn off Automatic Mode, and click the Settings icon. There, you can set a hotkey to declutter the desktop with a key command. And of course you can always use the Declutter Now button in the menubar drop-down too. Declutter stays out of your way, doing its tasks in the background so you can focus on getting work done with a nice clean Desktop. Think of it like a housekeeper for your Mac, just another little perk of subscribing to Setapp. *All gifs made with Gifox app.